Fresh off a great experience at the WELS Synod Convention, the WELSTech team returns to their summer series of Ministry Resources. If you use Google Calendar, you won’t want to miss this one. Also, listen for some interesting uses for Trello and an exciting announcement regarding an upcoming conference in Wisconsin Dells! Upping the Google Calendar ante – WELSTech followers will know that Google Calendar is a highly-recommended tool for collaborative management of church and school events. On today’s show, we share an online utility, Print My Cal, that enhances the printed version of Google Calendar for newsletters and bulletin boards. Check all of the Synod Convention video updates including this one, featuring Pastor Michael Herbst from our sister synod in Germany. Episode 510 – Tune in to learn about the new Called Worker Compensation Calculator which debuted at Synod Convention. Release date: Wednesday, August 16. WELSTech is back, and Martin and Sallie are side-by-side in Watertown, WI to continue our biennial tradition of special coverage at WELS Synod Convention. We’ve got a great lineup of interesting interviews to give you an insider’s look at different topics related to convention. Prof. Earle Treptow is on the faculty at Wisconsin Lutheran Seminary and serves as the chairman of the WELS Compensation Review Committee. He presented to the convention delegates several recommendations from the committee as well as debuted the recently developed Called Worker Compensation Calculator (wels.net/cwcompcalc). Dr. Jeff Wiechman is Vice President for Academics at Martin Luther College as well as chairman of the convention Elections Committee. He explains why that role makes him a frequent visitor to the speaker podium. Plus we get an update on the state of technology at MLC. Mr. Lee Hitter serves as WELS Director of Communications, and his responsibilities not only include ongoing synod communication efforts but also the complete coverage of Synod Convention. He shares details on the many communication platforms in play as well as the effort that goes into sharing the convention experience with the entire WELS membership. You can learn more about the convention, and watch live streaming coverage and regular video updates at wels.net/2017synodconvention. Episode 509 – Ministry resources take center stage once again next week. Tune in! Release date: Wednesday, August 9. WELSTech comes to you from WELS Convention at Michigan Lutheran Seminary in Saginaw, MI this week. Martin and Sallie talk with several delegates about their convention experience and share lots of great ministry resources along the way. Martin’s pick of the week is a great utility for quickly and easily typing Christian Worship hymn verses. The delegates perspective – Martin and Sallie welcome four synod convention delegates to the show and get their first-hand impressions of the synod convention experience as well as a taste of technology in their various ministry settings. Special thanks to Prof. Paul Koelpin from Martin Luther College, Prof. Carl Hochmuth from Luther Preparatory School, Missionary Terry Schultz who most recently served in the Caribbean and Layman Brent Nemmers from Atonement in Plano, TX. Ministry resources abound – Viewers get a bonus treat in this episode of WELSTech as Martin and Sallie break up the interviews with not one, but three, ministry resources! Animated videos explaining multi-grade classrooms from Principal Timothy Vogel, Shepherd of the Hills, La Mesa, CA. Thanks to Pastor Emile Burgess from Trinity, Caledonia, WI who has created a Text Expander file of Christian Worship (CW) hymns. It works with Phrase Express for Mac as well. Check out the details on the WELSTech Wiki. This video feature is something our convention delegates will also be viewing, the preview trailer for My Son, My Savior. Find it on the WELSTech Presentation/Teaching Videos playlist on YouTube. Learn more about this film, scheduled for release Fall 2015, at MySonMySavior.com. The biennial WELS Convention is just around the corner so this week’s WELSTech includes an overview of the technology at work to bring synod convention to those who observe from afar. A discussion of the the redesign of the WELS.net site is included. 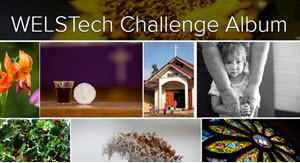 Plus there’s new developments from Google, recommendations for screen casting software and news regarding the much anticipated update to the Google Lectionary Calendar. Sharing the news – Lee Hitter, Director of WELS Communications, chats with Martin about the various ways the events of next week’s synod convention will be available. He also shares information on the recent WELS.net redesign and move to the WordPress platform. Swarm & Facebook – Check in at church! New on the Google Lectionary Calendar is Church Year A 2015-16. Thanks to Pastor Jon Schroeder for your work on the calendar which a huge help in worship planning to many! The newest addition to the WELSTech “Like’s” list on Vimeo is the latest Heart to Heart parenting webcast hosted by Nicole Balza. Tune in for a discussion of bullying, over-parenting and discipline. We’re celebrating on WELSTech this week as we broadcast our 300th episode from WELS Synod Convention. Tune in for WELSTech by the numbers, not one or two interviewees … but five, and even special party cupcakes. Celebrating tech in ministry – Martin and Sallie are side-by-side for this special episode, the 300th WELSTech filmed from the floor of WELS 62nd biennial convention and for the first time in front of a live audience. They take at look back at WELSTech by the numbers. Just how many picks of the week have been made in 5.5 years? And they are joined by a host of interesting convention delegates who share their perspectives on tech in ministry. This week on the WELSTech podcast the discussion centers on the technology behind this year’s Synod Convention. Pack your bags – If you can’t be in Saginaw, MI next week for WELS 2009 Convention, you can enjoy the next best thing, a virtual convention experience complete with live video and audio streams, images, blogs, online resolutions, daily news and more. Martin and Sallie discuss the technology of convention and how your congregation and school might capitalize on some of the same “tech”niques. Nancy Thompson from Victory of the Lamb in Franklin, WI shared more details about their use of ChurchCommunityBuilder.com. WELTech fans on Facebook are 71% male and 59% fall between the ages of 35 and 54. Help us reach 100 fans (go girls)! On our Facebook group page we heard from Dave Scharrer of St. John’s in Hemlock, MI, including a request for links to Sallie’s summer education sites.